Brian Anderson on Brian Anderson: “When people ask me what my favorite books were from my childhood, I have to admit that I didn’t read very many books as a kid. We had six kids in the house, and about that many books. We had The Cat in the Hat Comes Back, but not The Cat in the Hat. I think I was in high school the first time I ever read The Cat in the Hat. Two books that stand out as childhood favorites, though, are the picture book The Blah by Jack Kent, which I checked out regularly from the school library, and an old coverless copy of the Dr. Seuss Beginner Book Dictionary that was missing a few pages at the beginning and the end. It sounds strange, but the Dr. Seuss dictionary is the book I remember reading most from my childhood. Brian is the author of The Adventures of Commander Zack Proton series from Aladdin/Simon & Schuster. 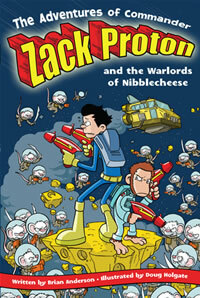 Titles include The Adventures of Commander Zack Proton and the Red Planet (June 2006) and The Adventures of Commander Zack Proton and the Warlords of Nibblecheese (October 2006). He lives in the Austin area. How did writing first call to you? In high school I used to play a lot of role-playing games like Dungeons and Dragons. But my dungeons weren’t just underground rooms full of orcs waiting to be killed; they were more like stories in which the characters were the protagonists. The players had a goal to achieve, and there were obstacles to overcome and plot twists along the way. In college I made up an adventure that I was particularly proud of–it had a great twist at the end–but one of the characters got an unlucky die roll early on and suffered a major injury, and the players decided to turn around and take a safer route, and missed out completely on the cool story I had spent so much time creating. I decided to start writing fiction after that, so I could have control over all the die rolls. Sprints, stumbles, and setbacks, I’ve had them all. Skipping all the years leading up to it, Zack Proton was a sprint. It was a slush pile submission that caught the eye of an editor at Simon & Schuster in my first round of query letters. She loved it from the start, but the project had to be redesigned and massively rewritten before she was able to convince S&S to buy it. Zack Proton was originally intended as a traditional chapter book, with ten chapters and about 7000 words, but the final version is 19 chapters, about 4500 words, has illustrations on every page, and is full of goofy little asides like top ten lists, comic strips, and Zack Proton’s Tips for Young Space Heroes. Congratulations on the publication of the Zack Proton series (Aladdin, 2006-). What was your initial inspiration for writing these books? Thanks! In 2003, I was asked to teach a computer class to fourth graders. To help them learn the inner components of a computer (hard drive, RAM chips, etc. ), I planned to make up a series of worksheets about a fictional cyberspace commander who had lost his crew inside a computer. The students would learn about each component as the commander searched around looking for them. There wasn’t enough time to draw up the worksheets before the class began, but that was the spark that eventually evolved into Zack Proton searching outer space for his lost ship. What was the timeline from spark to publication of the first book (The Adventures of Commander Zack Proton and the Red Giant), and what were the major events along the way? My first story notes are dated February 9, 2003, and the book hit the stands on May 16, 2006. Most of the delay in between was due to me doing nothing. I spent a leisurely six months writing the first Zack Proton book, working on and off without a deadline. I didn’t do anything with the manuscript for about a year after that, just some occasional tweaking while I worked on other projects. I sent out the first round of query letters in June, 2004, and in October an editor at Simon & Schuster asked to see the rest of the manuscript. The next four months involved meetings, discussions, phone calls, e-mails, my editor going on vacation, rewrites, rejections, more rewrites, and finding the right illustrator. When the smoke finally cleared, Simon & Schuster offered me a three-book deal in March, 2005. The final manuscript was complete by then, so it was fourteen months from acceptance of the manuscript to publication. The biggest challenge was reformatting the story from a traditional chapter book into the wacky format it ended up in. My editor told me I had to cut the word count from 7000 words to 4000, but the story was pretty lean to begin with and there just wasn’t a lot of room for cuts. The first thing I did was snip out a thousand words of description because Doug Holgate’s illustrations would take their place, but after that things started getting pretty painful. I begged my editor for a higher word count, but she wouldn’t budge. In the end, I submitted a 4000 word draft that I hated. My editor hated it too, and so did everybody else who read it. I was convinced the project was dead then–things looked so grim that my editor even encouraged me to keep submitting Zack Proton to other publishers. That’s never a good sign! But she never gave up on the project. We did another round of rewrites to restore some of the most painful cuts, and she was able to sell that version. The final manuscript ended up around 4800 words. What did Doug Holgate’s illustrations bring to the stories? Doug’s illustrations really make the books come alive. He has such a unique creative vision that one of the best things for me about writing Zack Proton is when I get to see Doug’s illustrations for the first time. Sometimes Doug goes off with his own ideas–his vision of Big Large in the first book didn’t match my description at all, but I laughed out loud when I saw his version of the evil space giant, and immediately went in to change the text. Having Doug on the series has challenged my own creativity, because I want to come up with highly visual stories that give him the opportunity to showcase his talents. What do you love about your writing life? All kinds of things! I love the flexible hours, the feeling of satisfaction from finishing a manuscript, and the chance to talk with kids about writing and publishing. Sometimes the writing process itself is about as much fun as folding the sock load, but overall the whole process of creating a story and characters is uniquely rewarding. What are its tougher aspects? Screenwriter Terry Rossio says that being a writer is like having homework every night, and a lot of it. When I’m in the zone and the writing is flying along, it’s one of the best feelings in the world. That happened to me in 1996. The rest of the time writing can feel an awful lot like doing homework. The hardest part for me is continuing to write a first draft even when I know it’s bad and will have to be rewritten. It feels like a waste of time. But writing that first draft is the only way to get to the final copy. What advice do you have for beginning authors? Write every day if you can. You will either develop a habit of writing or a habit of not-writing, and either habit, once it’s formed, is hard to break. How about series writers specifically? Chapter books are usually plot-driven, and character development takes place more slowly, so you always have to be thinking a few books ahead to know where your characters are headed. Also, if the series is going to unfold chronologically, as Zack Proton does, then it’s important to keep sowing seeds along the way. For example, in the second Zack Proton book, Zack breaks something in the back of the ship, but I never say what it is, because at the time I wrote it, I didn’t know. In book three, Omega Chimp needs something to help save a planet, and that’s when I figured out what it was that Zack broke in book two. Also in book two, Omega Chimp gets a parking ticket on his spaceship, but we never see him pay it. You know that’s going to come back to haunt them later! What do you do when you’re not reading or writing? I have two daughters in middle school that am very involved with. I spend a lot of time with them and doing volunteer work at their school. I also teach chemistry at the University of Texas, and I make elaborate pinatas in the hot summer months. Some of my pinatas are online at www.pinataboy.com. In the Zack Proton books, Zack will soon meet his space hero idol Sam Spaceway, and find out that things are not always as they appear. Omega Chimp will learn that he has an arch-nemesis of his own, and those 10,000 FE-203 robots that disappeared along with their crazed inventor are still out there somewhere… Other projects I’m working on are a middle grade fantasy novel and an anthology of horror stories.